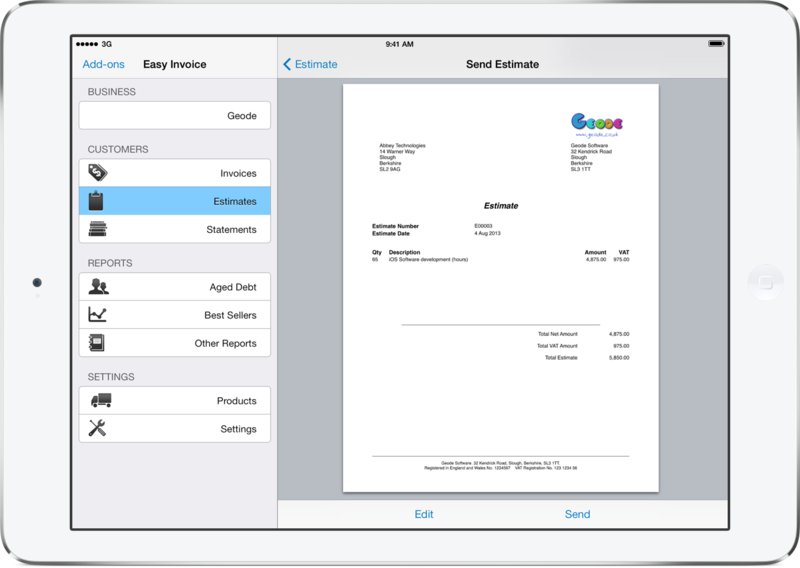 Use Easy Invoice to create professional estimates, sales invoices, receipts, credit notes and customer statements and send them straight from your iPhone or iPad in PDF format. You can also define a list of products you sell, setting volume pricing to speed up data entry even more. Then track your best selling products, your best customers, who to chase for payment and how much sales tax you've collected using the built in reports. Professional Invoicing, including Receipts, Estimates and Statements. Full set of reports including Customer Aged Debt, Best Sellers, Tax Breakdown. Define your sales tax accounts. Set a passcode lock to secure access. Backup and restore your data by email or storage in a third party app such as Dropbox or Evernote. Choose between A4 or US Letter page sizes. PDFs are all produced locally on the device. For a full feature list, see Features in the User Guide. Invoice text labels can all be changed to suit your requirements. Choose between A4 and US Letter paper sizes. Customise your letterhead/logo, footer, payment terms and more. Send receipts and credit notes too. Use filter buttons to quickly find all unpaid invoices. Remember the amount but not the client? Search handles amounts such as 120-140. Lots to invoice? 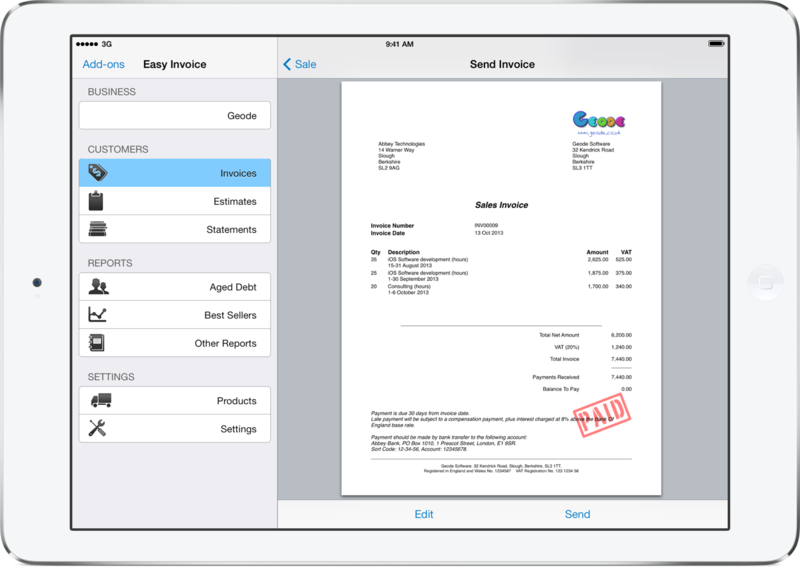 Easy Invoice automatically creates multiple pages when needed. For more information see Using the Invoices Screen in the User Guide. Create quotations quickly and easily. 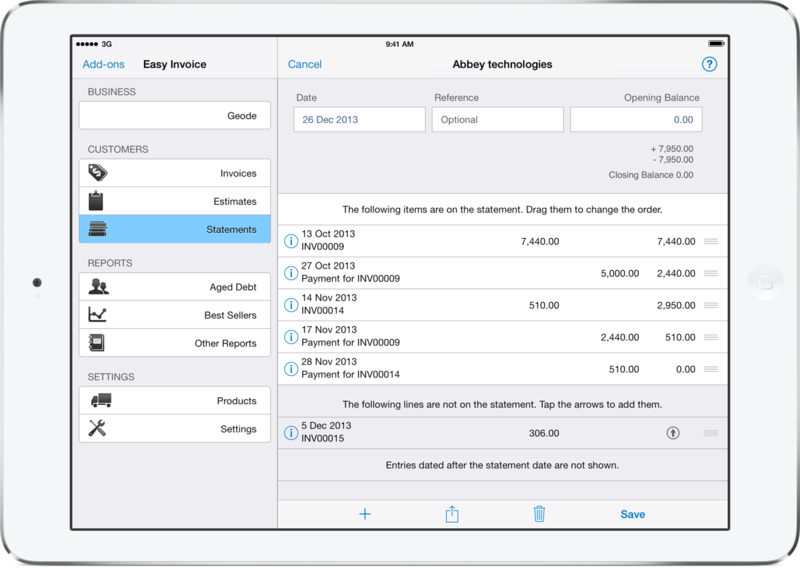 Customise them just like sales invoices. 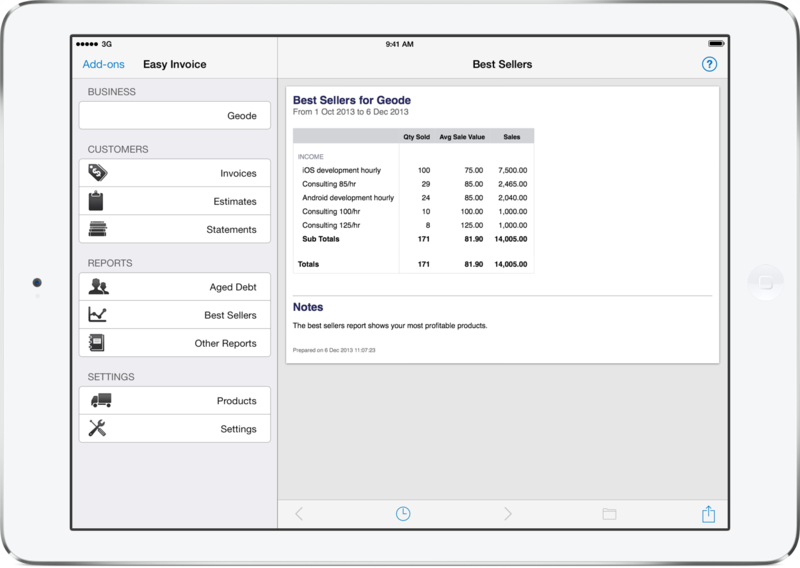 If accepted, turn an estimate into a sales invoice in just a couple of taps. For more information see Using the Estimates Screen in the User Guide. Statements show all sales, received payments and credit notes. Set the date and simply tap your sales and payments to move them to the statement. Drag items around to change the order. Statements act as a gentle payment reminder for your customer. For more information see Using the Statements Screen in the User Guide. Create products to help speed the process of creating sales. 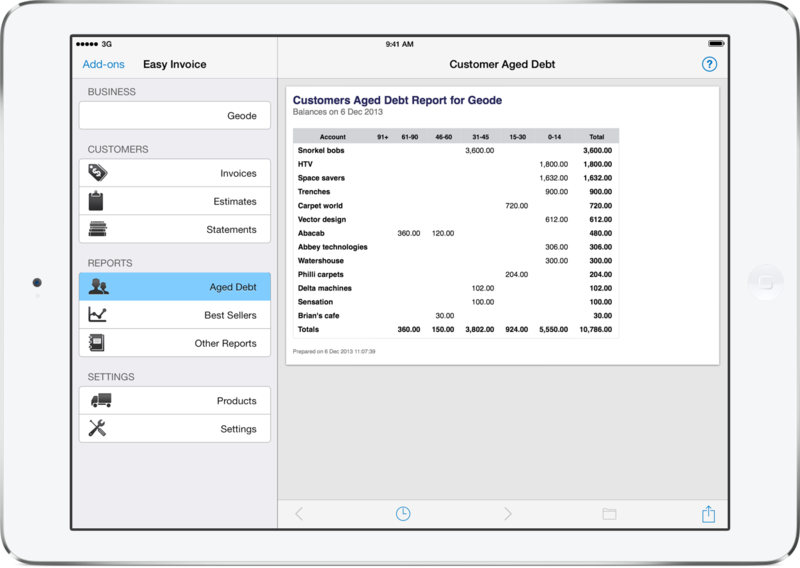 Define your own product code and separate description for your invoices. View you best selling products. For more information see Using the Products Screen in the User Guide. All reports can be sent as HTML, CSV or ZIP (containing both). For more information see Reports in the User Guide. Online Sync provides continuous online backup of your data whenever you make a change. Everything is sent to your other devices, whether Mac or iOS to keep them all up to date. Should something bad happen to your device, you'll just need to sign in to retrieve all your data. The system makes regular backups of your data should you want to undo a recent change and go back to an earlier version. If you have more than one business you can make use of the sharing feature to share just one business with a partner or your accountant. Share with read-only or full access. You can try the service out for two weeks free. Just register for an account at sync.easybooksapp.com.